Harajuku girl wearing a pleated Issey Miyake dress with heeled booties and accessories by Chrome Hearts, Facetasm, Aoki Yuri, and Anna Sui. Harajuku girl wearing floral print kimono sleeve dress, fishnet stockings, floral print socks, babydoll shoes, a bow handbag, and cute nails. Japanese model with pink-purple hair wearing fashion by ACDC Rag, HellcatPunks, Milk, Vivienne Westwood, Anna Sui, and Yosuke. Harajuku girl in chic street style fashion with tattoo stockings, doll shoes, draped jacket and short button skirt. Harajuku girl in all black t-shirt and maxi skirt with white sandals vs. Harajuku guy in chambray shirt, brown jacket, jeans, backpack and black shoes. 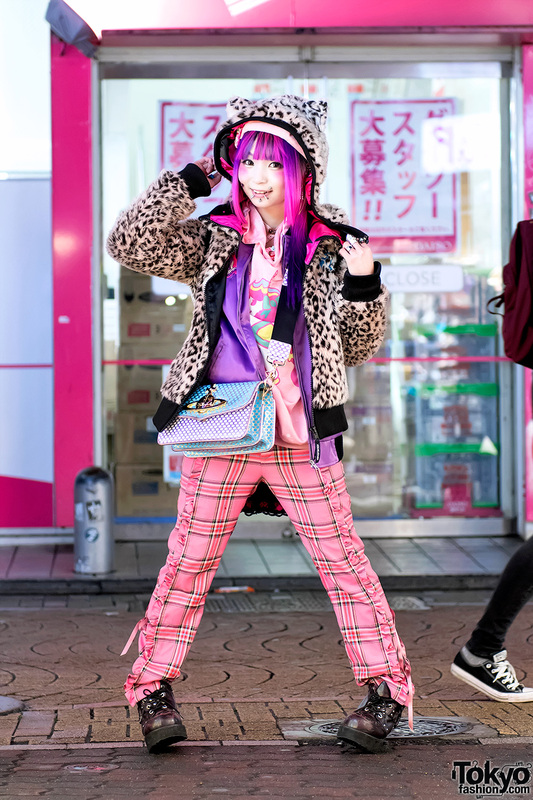 Harajuku girl with pastel hair wearing a maxi dress with tiger design, hoodie, handbag, rhinestone nail art and sneakers. Harajuku girl in faux fur coat, turtleneck, mini skirt, pug bag, polka dot socks and retro heels. Harajuku duo in matching outfits with t-shirt, jacket and skirt over pants, platform-heeled boots, handbags and jewelry. Gothic Harajuku girls with twin tails, mini skirts and over the knee socks with lots of jewelry and accessories.